I received a Minted gift card in exchange for this post to style my boys modern teen bedroom. All opinions and product selections are my own. Affiliate links are used in this post. Art can make a huge difference in taking a room from bland and boring to wow with a designer feel! We recently updated our boys bedroom and put a lot of thought into the layout and pieces in the room. But it was missing something major, the art! We ordered art to create a modern teen bedroom from Minted and it was amazing to see the difference in from before we added the prints to the room to the after transformation. 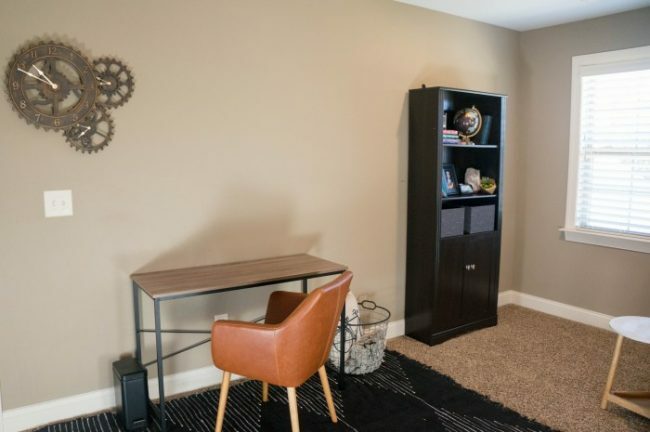 Plain walls make the furniture pieces look randomly placed and not intentional. They don’t feel anchored in the bedroom. There room also lacks interest and there’s not a lot that catches your eye. Isn’t it pretty amazing seeing how adding this cluster of prints really transforms the space? My eye instantly goes to the art prints and carries throughout the space. You can use art to create interest and a focal point or really just give the room that finishing touch like icing on a cake. We scattered modern art prints all around their teen bedroom to create interest and focal points. Creating a cluster of prints can really make a statement. Choose prints that will coordinate in colors or styles and can draw the eye from one print to the next naturally. Our boys modern bedroom is themed around black and white with hints of gold throughout the room and navy accent pieces. These prints really captured the color and feel of the room we were looking for. We used the black and white Rock Formations 2 print as a focal point for this wall. My boys like trying to find different shapes within this print, just like cloud gazing. Since it has so much texture within the black and white print it’s really fascinating to look at. We paired it with the gorgeous Aurum Sand No. 3 to give the gold hints throughout the room an anchor point. My one son loves anything gold, this is by far his favorite art print in the room. Adding the final print, a Soma Art Prints in Dove, balances out the space and ties all the room colors together perfectly. 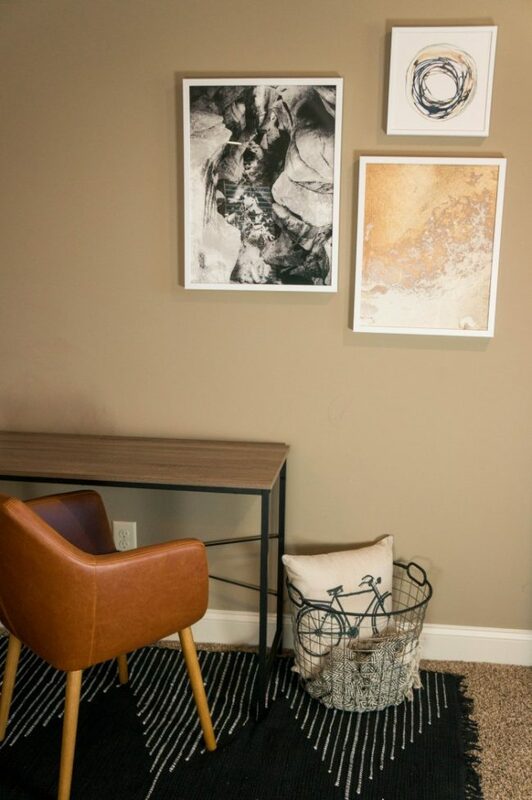 Using the same frame created a cohesive look that ties all the artwork together. 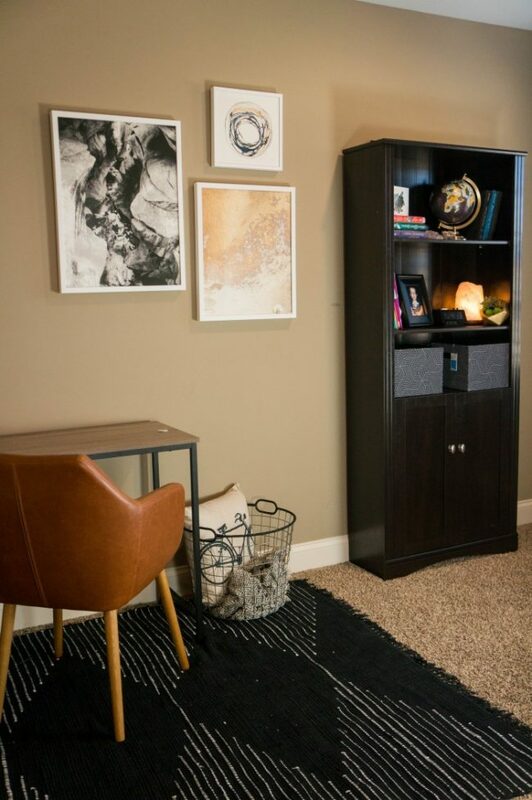 We used a smaller nook area to cluster two smaller art prints to bring interest and contract to the space. For here, we started with Rock Study 2 Fluorite to reflect my son’s hobby of rock collecting and tie in the subtle blues and gold colors in the room. The white wood frame lets you focus on the print. 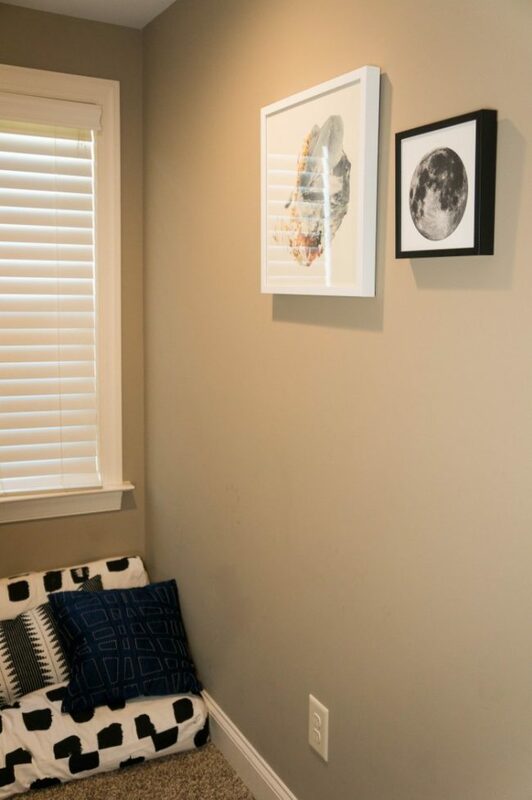 Along side this print we wanted a good contrasting piece and loved the La Luna Art Print of the moon with a dark contrasting black wood frame to pull out the deep grey and black hues in the picture. The smaller prints work perfectly here where there’s a small nook area just for reading. Large prints can demand attention and choosing a print with deep hues can really focus the eyes as well. The Rock Formations 2 print really does that for us on this large and previously empty wall. We used a cluster of art paired near a tall bookshelf to create height and a focal spot that gives this wall the finishing touch it needed. 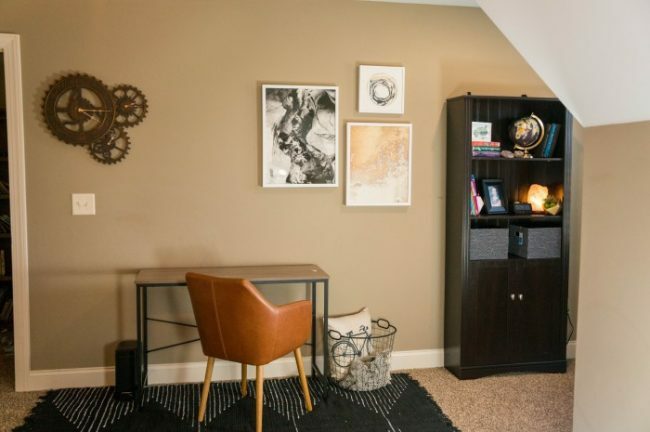 This space here has really become the focal point of the whole room, with the help of art. 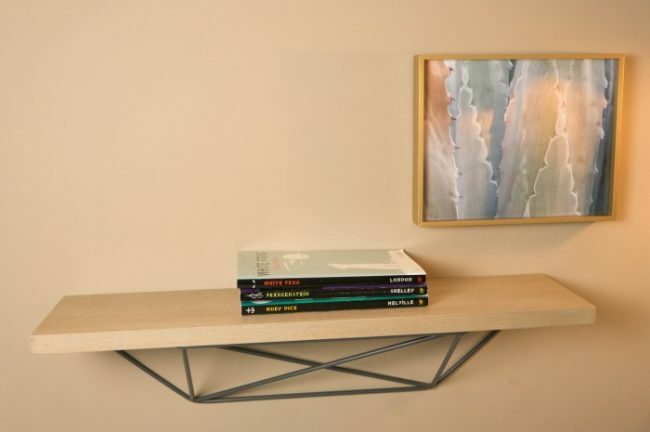 A perfect accessory for bookshelves is adding an interesting piece of art to give interest and a conversation piece to the space. It also helps create a finished looking bookshelf that isn’t simply lined with books. 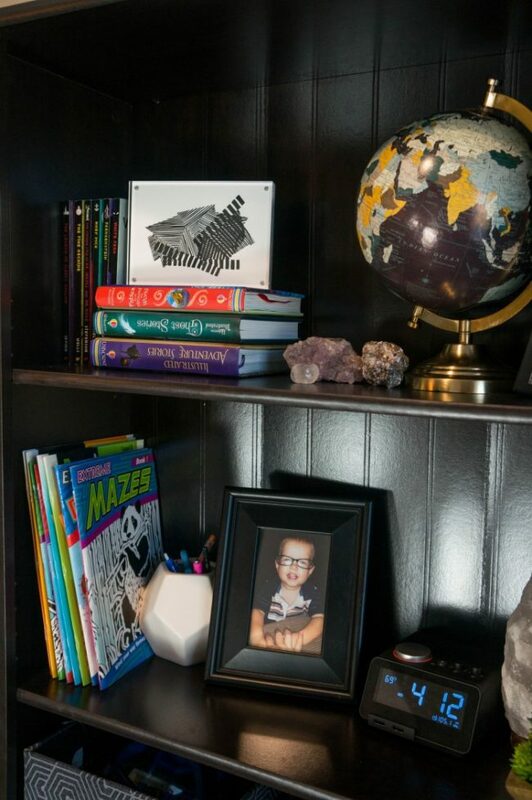 Here, we stacked a few books horizontal and added a Layers Art Print into a clear acrylic block frame to let it be the focal point on the shelf. This print is so interesting to look at with the depth created with layers of black and white stripes. When planning out our teen boys bedroom one of the pieces we planned to add was a wall mounted shelf next to their beds. This gave them a make-shift night stand as they don’t have room beside their beds for any type of table. It gives them a place to set their books, small toys, a water bottle, or whatever else they need to easily reach while in bed. Once the shelves were hung, I noticed they were lacking that something special to make them looked styled. Adding a small print to the wall just above the wall shelves so it was anchored and not taking up the actual shelf space perfect fit the bill. 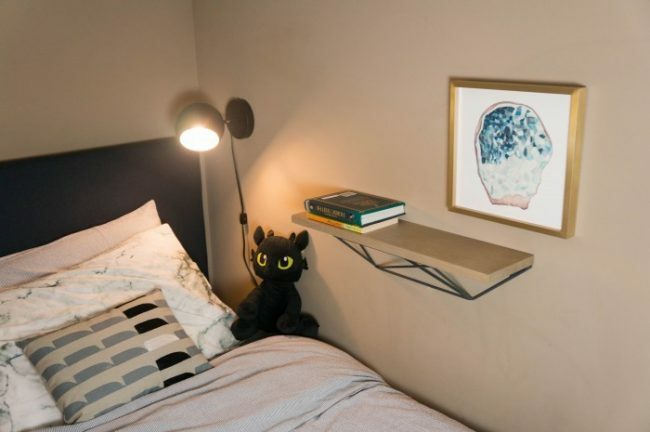 It gives a completed look to the nook space by their bed and was a place we could use art to reflect their unique interests. This Crystalized Geode art print was perfect for my rock collector and pulls in the same colors we’ve used throughout the room. The matte brass frame is gorgeous and really gives the art a designer feel. On my other son’s side of the room we picked the Etched Two Art Print which features a close-up view of an agave cactus. We recently moved from the Phoenix valley, so this ties in our roots where our family spent so many years. I love the colors that are subtle but interesting and the frame really complements the print. One final way your art can really impact the space is by using a mirror strategically placed to carry the prints across the room. We have a mirror placed across the room from our focal wall which brings in extra light and reflects back the prints giving the room an impactful finished look. When you look back through the mirror, the room looks finished and complete and you get a whole new way to enjoy the art prints you’ve added into the space. Minted is the best place to find art for your home. They have so many styles to choose from created by a marketplace of independent artists and vetted o be the very best art available. No matter what theme you choose for your rooms, Minted has fine art prints that can finish off your space and really become the focal point of your room design. The prints will ship safely right to your front door and can come framed and ready to hang or as unframed prints. Previous Post: « Why Oil Changes Matter, and Now They’re Even Easier! The artwork really draws the eye. I like the addition of the mirror. It helps make the space look bigger as well. My daughter would love some of these pieces for her room. I think I need to go shopping. My son is getting right around the age where he is interested in designing the decor in his bedroom. I love what you create and will definitely be bookmarking this post to keep your tips in mind! I love this bedroom idea! Super fun and modern. I agree, it’s great for a teen. I love Minted, I’ve used them for cards. Art can really make a room and it’s such a fun way to update a space. This is such good use of wall space! I definitely like the prints you went with. They’re super unique! I love this idea. It looks so nice. I would love to do this for my girls when they’re a bit older. Wow I love what you did to the room! 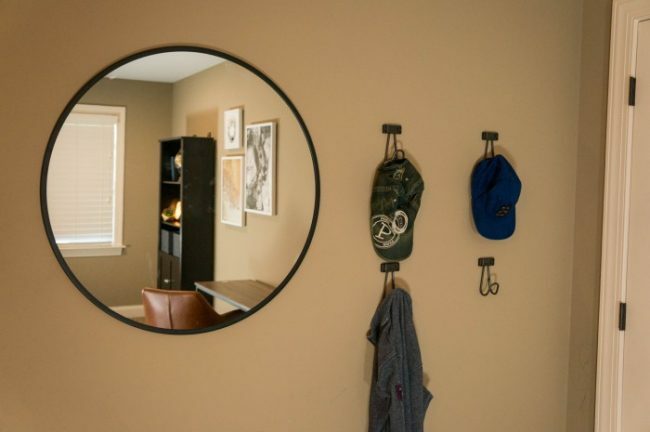 The mirror and the art work is just perfect for a teen boys room! I love this idea of adding artwork to walls. I would also consider photography for a cheap alternative. You did an amazing job on that space! I love your use of art and of that super cool mirror. Such a great look! Art is one of the best ways to spice up a space. I love how you used it in this room treatment. Soon my kid will be a teenager, he will like this bedroom decor.